Not only have I enjoyed these authors books...their websites are fantastic!!! Click the pictures below to get ACQUAINTED with these wonderful books. Rachel’s book Girl Wash Your Face, was a FANTASTIC read. I recommend this book constantly. When I didn’t think anything could top her book, she has the most amazing website on the planet! It lets her readers have access to “All Things Rachel” all the time! Andie’s book It Was Me All Along is so real and transparent, I connected with her instantly. Her website is FULL of amazing healthy recipes that have help her maintain her massive weight loss, as well as reader weight loss success stories. .
Elizabeth’s book Big Magic is a book a friend recommended to me in January 2018 and this book actually is a big reason why I started my blog. 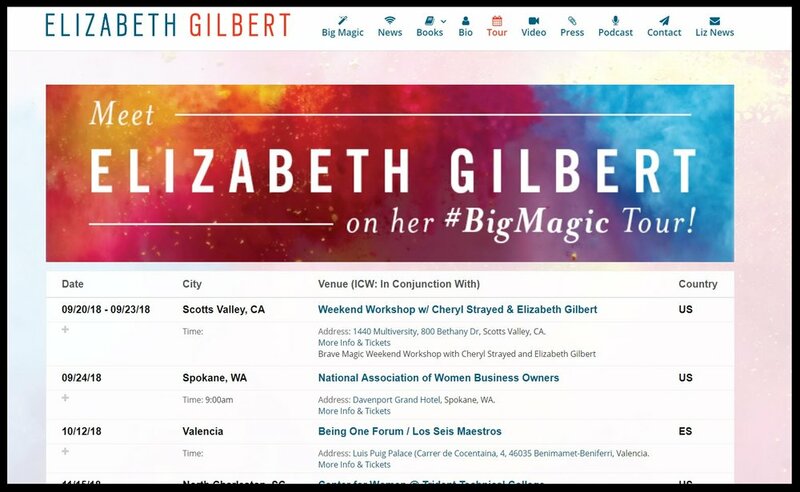 Elizabeth’s website keeps fans up to date on her engagements. I was so bummed I missed out in her sold-out Boston,MA appearance, but I will see her at some point! Janet’s books the Stephanie Plum Novel Series are so much fun and yep you guessed it, so is her website. Her website was her daughter project. I love that it’s a family affair! My favorite section is the reader pet section. It’s on my list to get my handsome canine son posted there! See the website PREVIEWS below and click links to discover and explore these amazing sites! Please share your thoughts on the books and websites in this post and please please please tell me about your favorite books and websites below, I will definitely check them out!